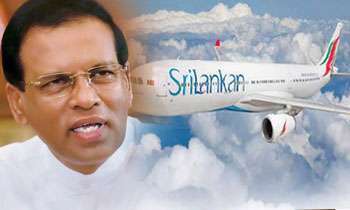 SriLankan Airline has said that it had stopped serving cashews after President Maithripala Sirisena flew into a rage over cashew nuts served to him on a flight to Colombo, the AFP reported on Wednesday. An Airline spokesman said it has responded by clearing its stock of cashews which are only served in business class and would change its Dubai-based supplier. Speaking at a farmers’ event held in Hambantota on Monday, President Sirisena said, "Returning from Kathmandu, I was served some cashews on board a SriLankan flight, but it was so bad even a dog wouldn't eat it. I want to know who authorised the purchase of these nuts." The AFP said this is not the first time that nuts served on an airline had prompted outrage. In 2014, a South Korean heiress famously ordered a Korean Air plane back to its gate to eject a cabin crew member after she was served nuts still in their packet. First Milo now Cashew Nuts what next.Why don't Sri Lankan consider serving Sarabulath! In his own mind he thinks he is developing the country. Mr. President what nonsense is this? Making not only a national issue but giving bad publicity to your countries own airline internationally. You should have taken this up with the management, as people and the country have much larger issues than this. Exactly. He is behaving like a spoilt child. Poor show. Oh dear, I was looking forward to my next flight and the Cadju served on board! This is an economic calamity that the President of the country had to get involved in. I think Sri Lankan should hereafter serve it's local passengers "Gal" and "Isso Wadai" !!! HA HAAA ..... THE ONLY THING OUR BELOVED PRESIDENT STOPPED IS SERVING CASHEW NUTS ON SRILANKAN. Not only cashew nuts, Buy all from China by on-line payments. Do not think about your country. Import everything from some other country. Tell everyone to buy foreign products. I frequently travel on Srilankan Airlines Business class in fact I traveled as latest as a week ago. I found no issues with the quality of the Cashew Nuts being served. I wonder if he has sprinkled the Silica sachet in to the nuts thinking they are salt..
Not the Nuts please take off the Silica gel packet...our president must have eaten that too and complaing nuts are not good!!! I didn't know that 'nuts' were still running the show at Srilankan! a nut ate nuts and everyone going nuts! nutty sri lanka.